The Sherpas are eating their dinner. Aadam and Seth are playing cards. We just had a session on knots and fire starting. Aadam and I both are able to start a fire with only flint and steel. Dinner is over. In essence the perfect evening. So was it worth it. Absolutely! Both Aadam and I had an incredible time. We spent lots to time together, made many new friends, and we challenged ourselves. 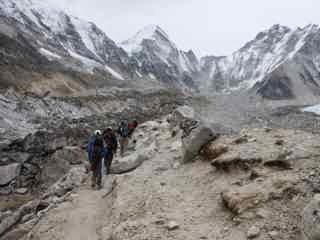 Nepal offers incredible trekking but the infrastructure is very basic. Simple lodging with no heating (the rooms were incredibly cold) and toilets that required some getting used to. But we certainly fell in love with the people. The Sherpa are an incredible group of individual. Their hard work, resourcefulness, and constant positive attitude are certainly something to emulate. We are excited to come home but we will miss Nepal. Tomorrow we hike to Lukla, where we spend the night, and then catch a flight to Kathmandu the following morning. - explored the geology of Everest. - and become much closer to one another. We are in Kathmandu for our final dinner, a tour of the Canadian Hospital in Kathmandu, and some last minute shopping. Then off to Hong kong, Vancouver, and finally Calgary. It is time to return to our normal lives in Calgary and our routines. We are looking forward to this. We miss our family dearly. Wow Aly. You and Aadam are amazing. Great adventures and bonding time. Safe travels back!